White paper on crime 2004 Part3/Chapter1/Section2/4. 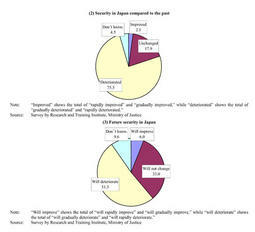 In the2004survey,questions were asked about respondents'beliefs on security in Japan,separately for current security,current situation compared to the past,and security in future. Fig. 3-1-2-6(1) shows the percent distribution of respondent's beliefs on security.More than60%of the respondents recognized security in current Japan to be"poor. "For reasons why they think so,17.4%answered"vicious crimes are committed frequently,"16.9%answered"crimes are committed frequently overall,"and12.2%answered"the level of morality in society becomes low." Fig. 3-1-2-6(2) shows the percent distribution of beliefs about current security compared to the past.Those who answered that security"deteriorated"compared to the past accounted for75.5%of all respondents.For reasons for so thinking,17.7%answered"vicious crimes have increased,"16.4%answered"crimes have increased overall,"and13.5%answered"the level of morality in society has declined." Fig. 3-1-2-6(3) shows the percent distribution of beliefs about future security.The largest percentage of respondents also held a pessimistic view that the security in Japan"will deteriorate"in the future.For main reasons why they think so,19.3%answered"the level of morality in society will decline,"16.7%answered"crime is likely to increase overall,"and11.8%answered"society is likely to become more globalized."